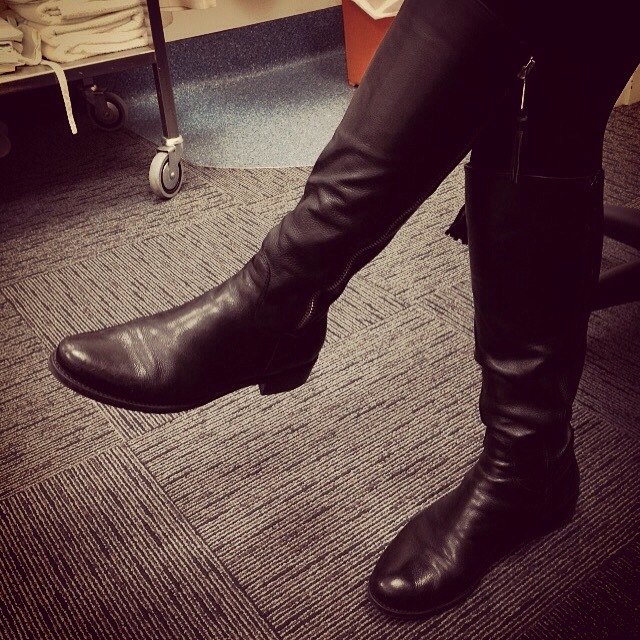 To celebrate the end of fourteen months of PTTIPOS, (that’s Post Treatment, Tamoxifen Induced, Psychotic Ovarian Syndrome, here is a picture of the brilliant Dr Claudia’s winter boots. “Thank you Dr Claudia!” I blushed. We felt it would be much less likely to traumatise than some GoPrOvary images of my cysts, endometriosis and pelvic adhesions. Close your eyes, take a deep breath. Imagine a world where every doctor you ever encountered was as great as Dr Claudia. Carer and curer of women afflicted with PTTIPOS. I’m not totally heartbroken though, as sometime next year Dr Claudia will remove my ovaries and fallopian tubes. So there will be future dates, err, I mean consults ahead. *PTTIPOS has not yet been included in medical encylopedias. But I think it deserves a spot.